Los Angeles, CA (January 23, 2019) – Los Angeles Police department has arrested a woman who is suspected of looking at messages on her cell phone and hitting a pedestrian with her vehicle in Westlake Wednesday evening January 23rd. 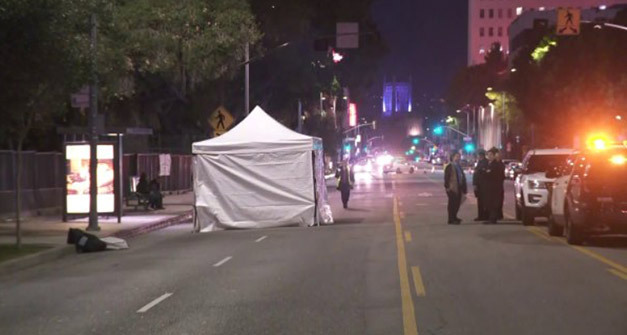 According to Los Angeles Police department officials, the incident was reported to dispatchers sometime around 8:00 P.M. near the intersection of 6th Street and Grand View Street in the Westlake neighborhood, near McArthur Park. CCTV footage obtained by authorities identified the driver of the SUV that struck the pedestrian as 38-year old Rosario Valdezinda. The footage shows Valdezinda driving an SUV eastbound on 6th Street where she struck a pedestrian who was running across the street in a marked crosswalk trying to catch a bus at a stop nearby. Valdezinda can be seen looking at her phone when the crash occurred. Valdezinda remained at the scene and attempted to help the victim. First responders arrived and pronounced the pedestrian dead at the scene. The pedestrian was described as a 65-year old Korean man who lived in an assisted living care center nearby. Valdezinda was subsequently arrested for drunk driving, driving without a license, and vehicular manslaughter. Her bail was set at $100,000 and she is scheduled to be arraigned on January 28th.